If you hang around cord cutting websites like this one for long enough, you're bound to hear about Tablo and other “OTA DVRs.” But what is Tablo? Is it a device, or a company, or what? And how to OTA DVRs work? And should you get a Tablo, or a different OTA DVR, or no OTA DVR at all? Valid questions all! But don't worry – we're here to explain. Below, we'll lay out everything you need to know about OTA DVRs in general as well as about Tablo specifically. We'll tell you what Tablo is good for and help you decide if you need one. Sound good? Then read on. 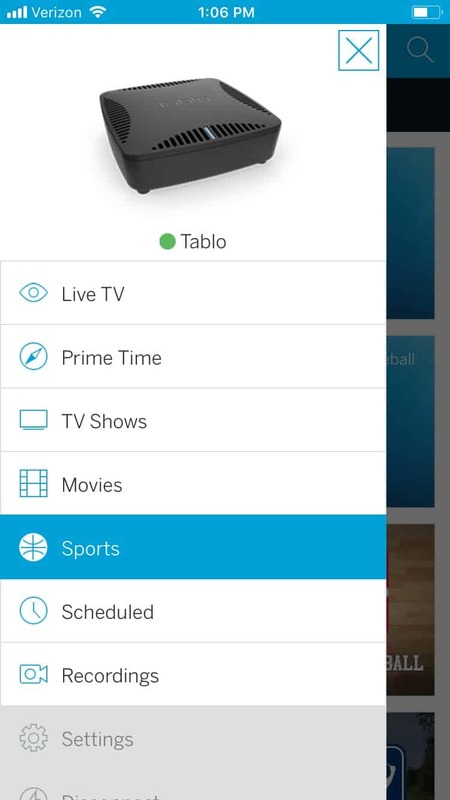 Simply put, Tablo is an OTA DVR. Tablo is the product name, so we should probably start asking “what is a Tablo” instead of “what is Tablo,” but the second question is at least sort of valid, because the folks who make Tablo tend to to use their product name as their consumer-facing brand. Technically, the company that makes the Tablo is called Nuvyyo – but you'll have a hard time finding that name on their website or anywhere else, as they just use “Tablo” for everything. So we'll just use “Tablo” loosely in this piece to refer to the device and the larger brand. About that device, though: what is it? What is an OTA DVR? What Is an OTA DVR? You probably already know what a DVR is. It's a digital video recorder, something most of us associate with cable or satellite. You get one from your cable company or buy one from a brand like TiVo at Best Buy; it's in a plastic box; the cable cord goes into it; you use the TV remote to schedule recordings; yadda, yadda, yadda. And, if you're a regular reader of Cordcutting.com, then you probably also already know what OTA is. It's over-the-air TV, of course, that wonderful free live TV that you can pick up with an over-the-air antenna. “Over the air” is a bit of a mouthful, so most people tend to use the abbreviation “OTA” instead. Free over-the-air TV, or OTA TV, is transmitted from local broadcast towers and can be picked up by an OTA antenna. Plug that antenna into your TV and scan for channels, and you'll be watching live TV in no time. But you don't have to plug your antenna into a TV. You could instead choose to plug it into something else – like, for instance, an OTA DVR. By now it will come as no surprise that an OTA DVR is a DVR that is designed for use with an antenna. But there are a few things about how OTA DVRs work that can be tricky. For instance, you need an antenna tuner to interpret the signal from an antenna. Your TV has one built into it. An OTA DVR will need one, too. But if it only has one, it can only record one thing at a time – which is why some OTA DVRs come with extra tuners. Another thing: if your antenna is plugged into your OTA DVR, then it can't also plug into your TV. Manufacturers of OTA DVRs have to figure out how to deal with this. Do they ask everyone to buy multiple antennas – one for their DVR, and one for each TV they want to use it with? Perhaps they could just run a cable from the DVR to the TV. But modern DVRs allow viewers to watch the same content on multiple TVs and devices. An OTA DVR could replicate this ability with a network connection. And if the DVR were also able to stream live TV, then an OTA DVR could double as a solution to one of OTA's most annoying problems – the fact that you usually need one antenna for each TV you want to watch OTA on. Now we have a general sense of what an OTA DVR is, as well as of the challenges faced by OTA DVRs. Time to move on to the Tablo, specifically, and see what answers it has to these questions. So now we know that we can answer “what is Tablo?” by saying that Tablo is a brand of OTA DVR. But let's get more specific, here: what is a Tablo OTA DVR like? What can it do? One complication we'll soon have to deal with is that there is more than one type of Tablo running around out there. But let's put that off for now and instead examine how Tablo devices work in general. After that, we can run through the Tablo roster and take a look at the different options. Okay, here's how it all works. You take your antenna. You plug it into your Tablo OTA DVR. And then you hop onto the Tablo TV app, which is key to how Tablo works (you can also use the TabloTV.com website, if you prefer). Using your app, you'll set up your Tablo OTA DVR, which will include connecting it to your Wi-Fi network unless you're using an Ethernet connection. That's it – you are ready to record. Using that same Tablo TV app, you can select shows from various content discovery screens, including the familiar-looking TV guide screen that you probably associate with DVRs. It bears mentioning here that all the pretty information on this screen comes courtesy of a Tablo TV guide data subscription, which costs $4.99 a month (you can save a bit by opting for the yearly and lifetime subscription options, which are $49.99 and $149.99, respectively and as of this writing). The Tablo TV app is available for a ton of different platforms, including popular streaming boxes like the Roku. That's key, because it means that a Tablo OTA DVR and its associated apps can help you turn one antenna into a way to watch live and recorded OTA TV in every room in your home. The only limitation, of course, is how many tuners your Tablo OTA DVR has – you can only watch or record one channel per tuner. (How many tuners your Tablo OTA DVR has will depend on which model you have, of course, which we'll discuss more in the next section). That's the Tablo experience, and it's about the same no matter which model of Tablo OTA DVR you have. Buying a Tablo OTA DVR will get you the DVR itself and a free trial of the Tablo TV guide data subscription. The app itself is free. You'll have to provide your own antenna. With some models, you will also have to provide an external hard drive to store the recorded files on. What's With All These Tablos? As I mentioned before, there is more than one Tablo! So, while I wait for Tablo's PR team to email me and ask me not to pluralize “Tablo,” let's look at all these Tablos. One quick note: all of the DVRs listed below include the DVR itself, a power supply, an Ethernet cable, and a free trial of the Tablo TV guide subscription service. The Dual Lite is Tablo's entry-level offering. It's a 2-tuner OTA DVR, so you can watch or record two things at once. The “Lite” in the name is the hint that, in the words of Tablo's copywriters, offers “flexibility to choose the recording storage option that works best for [you].” Translation: there's no on-board memory, so you need to supply your own external storage device. Street prices for the Tablo Dual Lite OTA DVR are south of $150, so this is a nice budget option. At the heart of the Tablo lineup is the Tablo Dual 64GB OTA DVR. It features the two tuners that the Dual Lite has, but it bests its little brother by including 64GB of on-board storage. The Tablo Dual 64GB OTA DVR retails for around $200 street. That's a $50 increase for 64GB of storage, which may be a little steep, but the overall price remains very palatable, and you can't put a price on not having a dang external hard drive cluttering up your entertainment center. 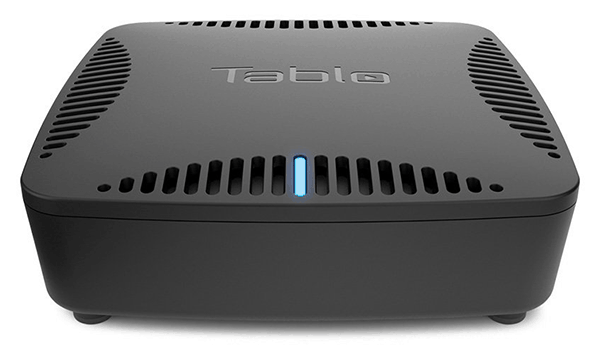 The granddaddy of all Tablos is the Tablo 4-Tuner OTA DVR. That's twice the tuners of the Dual models, of course. The bad news is that there's no on-board storage, but this device can accept up to an 8TB external hard drive. Eight terabytes is, uh, a lot. Like all other Tablo models, this device has an Ethernet port to use for a wired Internet connection. The Tablo 4-Tuner OTA DVR retails for somewhere between $250 and $300, which puts it close enough in price to the Tablo Dual 64GB OTA DVR to tempt you to shoot for the high life. Come on, what if you want to record four things at once? And now for a Tablo that sort of isn't a Tablo! Well, it's still mostly a Tablo. An OTA DVR is, hardware-wise, not a crazy thing: it's a TV tuner (or four) with a hard drive and a little computer to tell it what to do. Tablo's great apps and user interfaces and whatnot are what separate it from the crowd, so they could easily just license that stuff out and let other hardware manufacturers turn other devices into de facto Tablos (there I go pluralizing “Tablo” again). In this case, owners of the Nvidia Shield – that beefy, beautiful, and expensive streaming box – can install a Tablo DVR engine on their device to give it the smarts it needs to start recording stuff from a TV tuner. The Nvidia Shield doesn't come with a TV tuner, though, so you'll need to buy a USB TV tuner. You can turn to Tablo for that, too, as they offer the Tablo Tuner. So here we are, at the end of a long and fruitful journey that started with a simple question: what is Tablo? With that answered, let's ask another question: do you need a Tablo, or what? Do you like the content available on free over-the-air TV? Free OTA TV includes a ton of great stuff. The four major networks (ABC, CBS, Fox, and NBC) are staples in most areas, and PBS, Univision, and a whole lot more are also often available. We're talking NFL games, major-network sitcoms, evening news programs, and more. Do you want to be able to time-shift that same content? If you want to watch the latest CBS sitcom but don't actually want to stay up to watch it, then an OTA DVR like Tablo is just what the doctor ordered. If you're all about OTA's live NFL football and only ever want to watch live, Tablo won't hold as much appeal. Do you want to stream live and recorded OTA TV to multiple TVs and devices? We've explained before that, typically, you need one antenna for each TV in your house. But a Tablo device will free you from that tyranny, provided your TVs are equipped with smart features or a streaming box so that you can download the Tablo app. On top of that, Tablo will give you the power to watch OTA content on your phone. Stuck on the train home from work during Monday Night Football? With a Tablo and a smartphone, it's no problem. If you said “yes” to more than one of these questions (and if you're not already getting broadcast channel content from a skinny bundle that also offers a cloud DVR service), you may want to consider investing in a Tablo. For a pretty reasonable one-time cost (and, optionally, a small monthly fee), a Tablo OTA DVR can give you the power to stream live and recorded OTA TV. And, if you ask us, that's pretty cool.